The fashion world has always been a bit of a mystery to me. Funny enough, I worked in it for a while, or near to it anyway, and while there were pieces of it that intrigued me, “Oooh nice dress... Ahhhh shiny pages with stuff on them I can't afford,” or “Wow she’s tall. Honestly, how do they get that freaking tall?” I knew ruminating over whether skirt lengths were going to be long or short each season was never going to be my thing. As my old boss said to me one day over my review lunch, "Face it Anka, you don't want to write about this sh*t." He was a smart man. Coming from a family of 5 women with a model for a mother, for many years, I was definitely the sartorial black sheep of the family. Back then, I would often go out dressed in pyjamas and cowboy boots or wear these rusty tin hair clips in my hair that would make my mother crazy and finish off the look with a pair of sweat pants and a Metallica T-shirt and simply, as they say, didn't give a toss. Or just to confuse everyone even more, I'd vary my look so wildly from one day to the next, that they weren't sure if I was channeling Little House on the Prairie, or Seattle grunge girl... I suppose I was kind of like your garden variety, fashion Sybil (it took me many decades to take an interest in what I was wearing and actually find my look that didn't involve pyjamas, and I give all the credit to my elegant mother). Furthermore, I never understood how people managed the whole keeping up with the fashion trend thing, without going bankrupt. "That's in. No, it's out now! Don't you know it's out??!! Wait it's back in!! But only for twenty five minutes!!" OMG. Which is it?? I happily pride myself on the items in my closet that I’ve discovered in old thrift shops and are older than a box of Twinkies (and are the exact pieces that get the most compliments) and don't give a sod if they're in or out. They're on me, how's that? 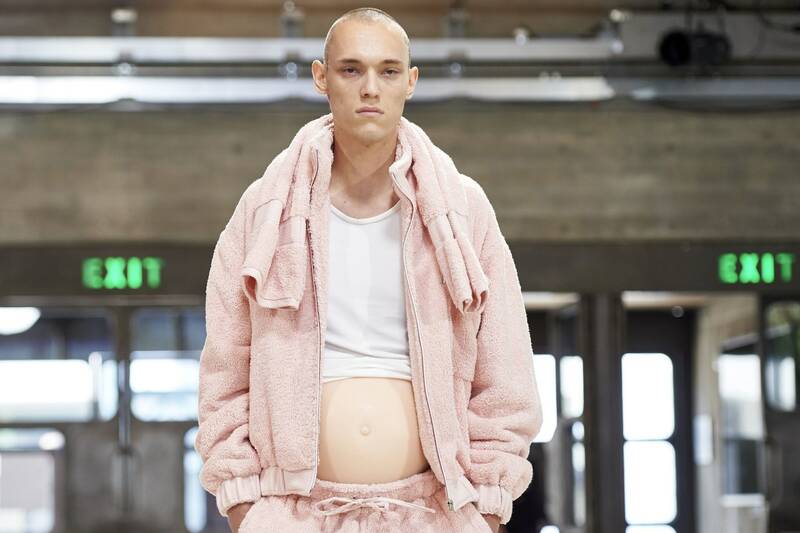 So the other day at London Fashion Week, a male designer, Xander Zhou had male models on the runway strutting their anaemic, robotic stuff (you know that stare they all have as they walk down the runway) wearing prosthetic pregnant bellies. Many of the bellies were exposed as the men stroked them or belly cupped their pseudo babies. The whole motto of the show was “New World, Baby,” and apparently showing men pregnant in fashion is a thing now. It's so en vogue dahling, as apparently we're on the precipice of men being able to carry life. News to me. I have to admit, at first it just cracked me up, inspired an eye roll and confirmed why many feel as if the fashion world is elitist and often out of touch – in short, what prosthetic bellies have to do with selling men’s clothes is beyond me? Especially as it’s not a maternity menswear line. Now that would be interesting! But it’s an intriguing age old curiousity that (some!) men have when it comes to women’s ability to grow and carry life. This, “See, one day we can do it too!” mentality as somewhere deep down it kills them that there is one thing we can do that they simply cannot. Plus you know half of men deeply resent maternity leave and that's why (ahem) in some countries we get something hideous like 14 days. As far as I’m concerned, I’m fine if they want to figure out how to make male child bearing happen. I wasn’t a lover of pregnancy barring a few weeks out of the 40 (yeah, I said it), and would gladly have given my husband the chance to get fat, be unable to sleep for nine months and squeeze the King’s 9-pound head out of his… well, they’ll have to work out those pithy little details once they're done playing with their rubber bellies.